Datsun is making its world premiere in India on July 15. Nissan's low cost brand unveils its first small car for the emerging markets in the event that is to be held in North India and we hear that the event would be presided by Mr. Carlos Ghosn himself. The first car codenamed K2 is based off the Nissan V-Platform, the same one that underpins the Micra and the Sunny. The second product codenamed I2 will arrive at a later stage. Both small cars are being developed at RNTBCI, Renault-Nissan's technology center, in Chennai. 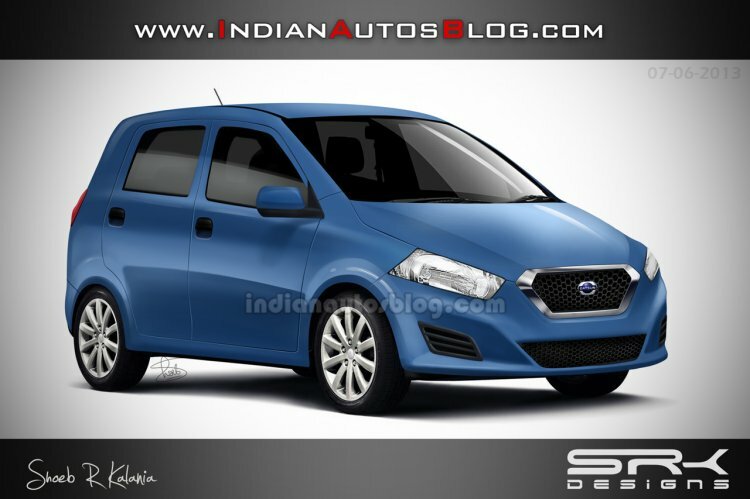 Here is a speculative rendering of the second car, the Datsun I2, by our in-house image manipulating expert Shoeb. The design of the car will be conservative and would feature a clean sheet metal design to keep the production costs low. The sheet metals are flat to keep manufacturing costs as low as possible. The Datsun I2 will have the Maruti Alto in its crosshair. While the K2 targets cars like Chevrolet Beat and Maruti Wagon R, the I2 will be positioned a segment lower to take on the likes of the Tata Nano, Maruti Alto 800 and Hyundai Eon. The A Segment hatchback is expected to be based on a bare-bones platform masterminded by the Renault-Nissan's low cost car expert Gerard Detourbet employing some aggressive cost cutting measures. However we don't expect it to be on the market before 2015. As of now, the powertrain details are sketchy, but expect a 800-1,000cc petrol engine paired to a 5-speed manual gearbox.